The purpose of this website is not to glorify or rehabilitate a convicted murderer. Rather, it is to provide information and opinion about a man who can be linked to the Jack the Ripper murders. William Henry Bury was born in 1859. On April 2, 1888, he married Ellen Elliott. The couple lived in the East End of London throughout the period of the Jack the Ripper murders. In January, 1889, William and Ellen Bury moved to Dundee, Scotland. William Bury forged an offer of employment from a company in Dundee to persuade Ellen to move with him. 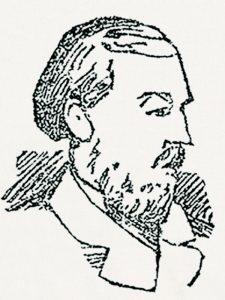 On one day early in February, 1889, William Bury murdered his wife, possibly in connection with a domestic dispute. He was convicted of her murder on March 28, 1889 and was executed by hanging on April 24, 1889. William Bury can be linked to the Jack the Ripper murders through signature analysis, which is a modern crime scene assessment technique that is used in investigations of serial homicide. There is signature evidence placing William Bury at the Martha Tabram, Mary Ann Nichols, Annie Chapman, Catherine Eddowes and Mary Jane Kelly crime scenes. In addition, there are supporting pieces of circumstantial evidence that help to confirm that Bury was indeed the Whitechapel murderer.